The Student Housing Replacement Project consists of two eight-story mid-rise towers that contain 980 beds. A dining commons facility is also part of the complex. 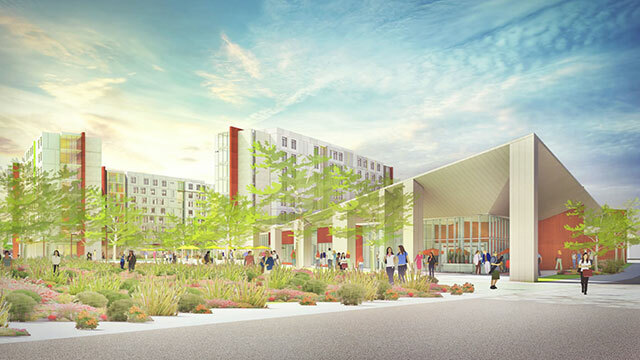 Commuters using Kellogg Drive are getting a change of scenery and a peek at the future of student housing at Cal Poly Pomona. The former route of Kellogg Drive, which ran along the Residential Suites and Scolinos Field, is the site for the Student Housing Replacement Project that will help meet the housing needs for future generations of students. The realigned portion of Kellogg Drive opened in late August and links commuters from South Campus Drive to Red Gum Lane. The months-long project by the Department of Facilities Planning, Design & Construction to realign the road allows room for the start of construction on the Student Housing Replacement Project, which consists of two eight-story mid-rise towers that contain 980 beds and encompass 280,000 square feet. A dining commons facility that can accommodate 680 students at a time also is part of the complex. Studies have shown that students who live on campus encounter more opportunities to grow socially and culturally, and develop leadership skills. The new $185-million housing complex will allow future generations of students to walk to Bronco Commons, the BRIC, the new Student Services Building and most of the academic buildings on campus. The complex will blend seamlessly with the Residential Suites to create a cohesive housing precinct. Funding for the project was derived from several sources that include the sale of bonds, university housing and parking reserve funds, and contributions from the Cal Poly Pomona Foundation. The realignment of Kellogg Drive adds 16 acres of buildable land. About half of the acreage will be used for the housing complex and a temporary parking lot for 400 cars. The remaining 8 acres will be set aside for potential future construction projects. The realigned road contains two northbound lanes and two southbound lanes with a center median and dedicated bike lanes on each side. A pedestrian walkway is planned on the side of the street facing the new student housing project. The last component of the realigned road is the planting of Chinese elm trees in landscaped parkways on each side of the road in the coming months. New traffic signals have been installed at the intersection of Kellogg Drive and Red Gum Lane. Stop signs were placed at the intersection as the new road was being constructed. Last May, to prepare for the start of the realignment project, a 500-foot stretch of Eucalyptus Lane was permanently closed, including its intersection at Red Gum Lane. Crews worked through blistering summer heatwaves to grade the land for the realigned road, construct sidewalks and gutters, and install underground utility lines. Nutrient-rich top soil uncovered by the grading process has been set aside and will be used for landscaping at the housing complex, advancing the university’s efforts in sustainability.